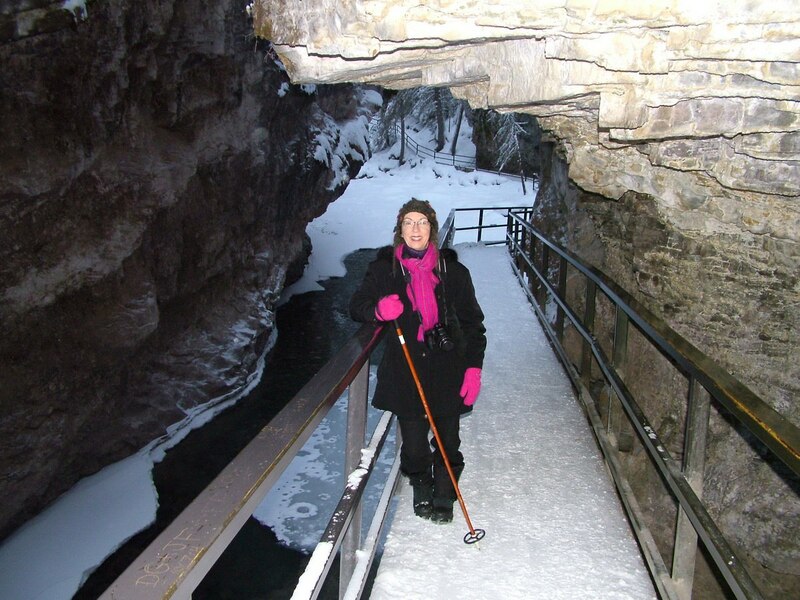 While visiting Banff National Park, Bob and I learned of a hiking trail at Johnston Canyon that promised views of frozen waterfalls after traversing the length of a deep river gorge beneath sheer canyon walls. We knew the experience would be right up our alley. 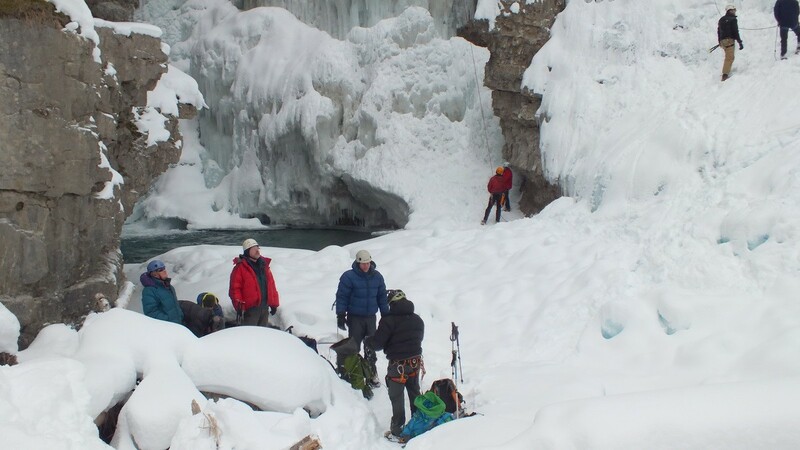 What we did not anticipate was finding a group of ice climbers actively ice climbing the frozen waters of the Upper Falls. 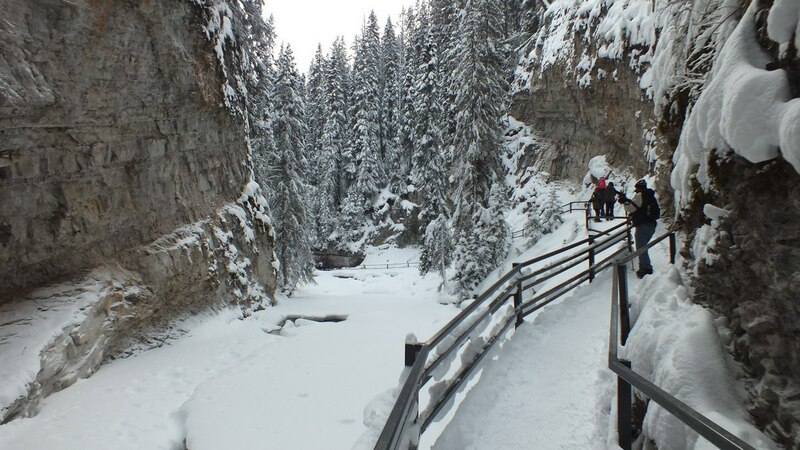 Johnston Canyon is accessible from the Bow Valley Parkway, and when we landed in the parking lot, even though it was mid-afternoon, dozens of cars still filled the spaces. We expected to encounter throngs of hikers along the trail. Upper Falls is reached by hiking 2.4 kilometres through the wooded canyon, with an elevation gain of 120 metres (394 ft). The round trip requires about 2 hours if you don’t dillydally. A lot of the visitors we met on the trail had opted to wear snowshoes, but Bob and I found that they were not necessary because the trail was well packed. Instead, we affixed ice cleats to our snow boots and found them to give great traction in the slippery snow. A series of catwalks and staircases cling to the canyon walls and assist hikers to mount the cliffs, so it was a bit unnerving with the gaping abyss directly below our feet. 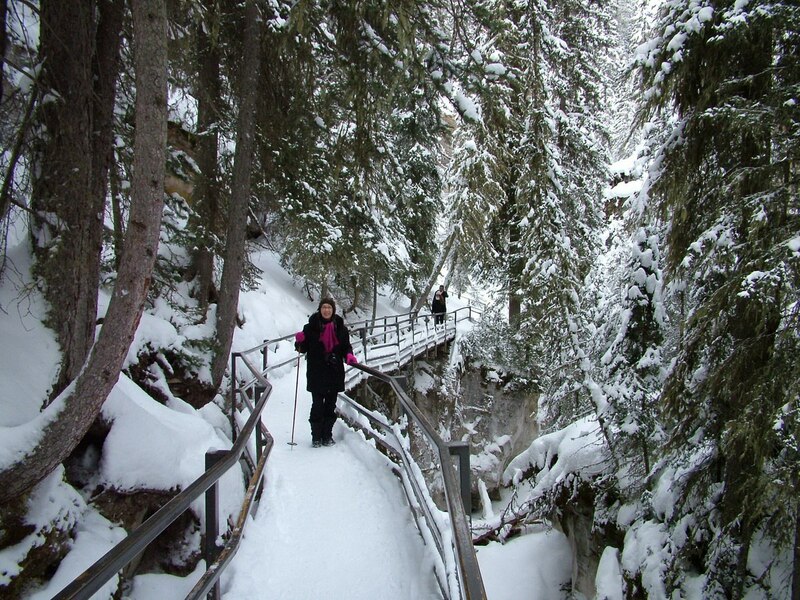 With a fresh snowfall bedecking the forest of spruce and fir trees, our venture into the Canyon was like entering into a winter wonderland. From the parking lot, it was necessary to climb a short distance before the trail begins its descent and then follows along the banks of Johnston Creek. In many places, the canyon walls overhang the sturdy iron catwalks. Due to a good portion of the Creek being frozen solid, our position so close to the flowing water was not nearly as disturbing had the turbulent waters been able to flow freely. Lower Falls is reached at kilometer 1.1, where a side trail leads to a bridge spanning the river. 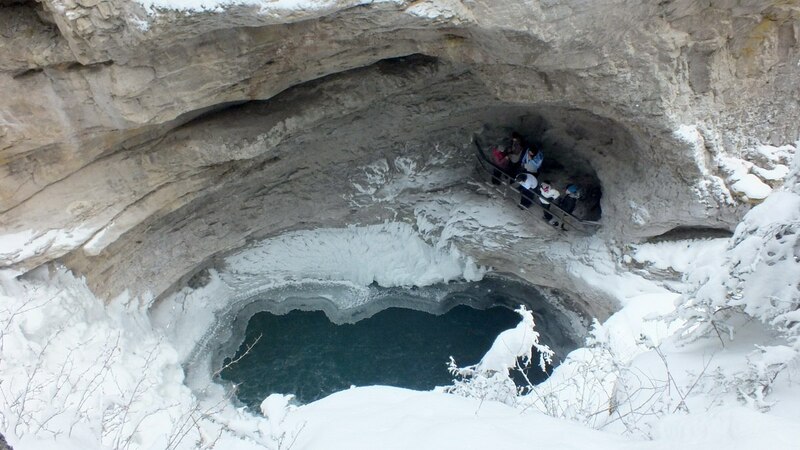 It also conveys hikers to a short tunnel through the canyon bedrock for an intimate look at the waterfalls. 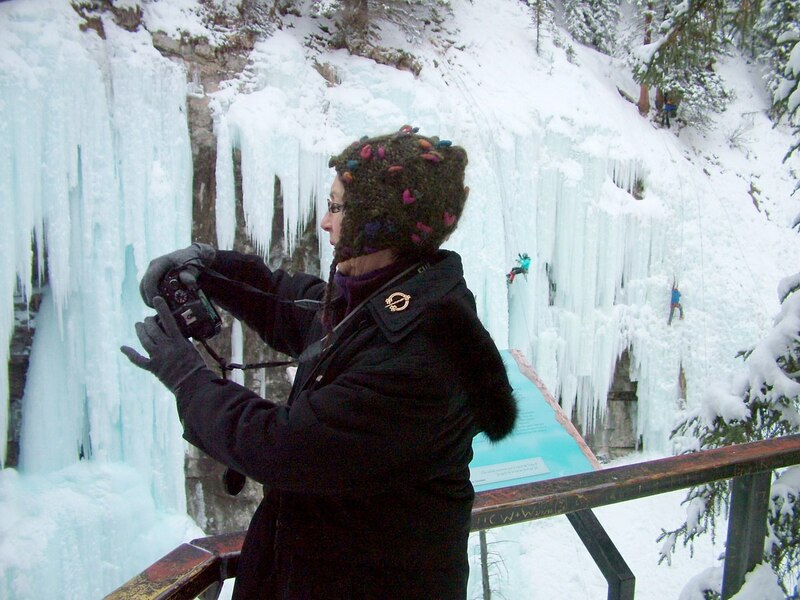 During warmer months, the bridge affords a spectacular view of the thundering cataract, but the day we visited, the frozen cascade all but silenced the volumes of water that normally would thrill visitors and also dampen their clothing. Instead, we were able to gaze into the depths of the aquamarine pool of water that surged and gurgled in a tight pool at the base of the falls and below the narrow tunnel. The unique twisting canyon had fantastic rock formations carved out by water and rock action, such as this deep pothole. Wherever a whirlpool initiates rotation by a rock or boulder that is carried in the current, the rock becomes a grinder that erodes the river bed and over time, forms a deep pothole. 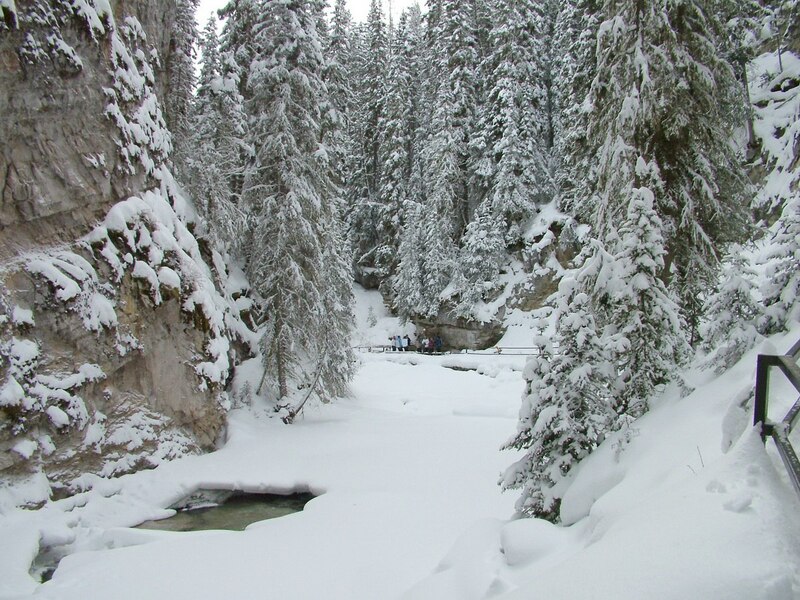 Johnston Creek is a tributary of the Bow River, and its source can be found north of Castle Mountain in a glacial valley with an elevation of 2,500 metres (8,200 ft). Bob and I saw Castle Mountain as we drove along the Bow Valley Parkway a day earlier. 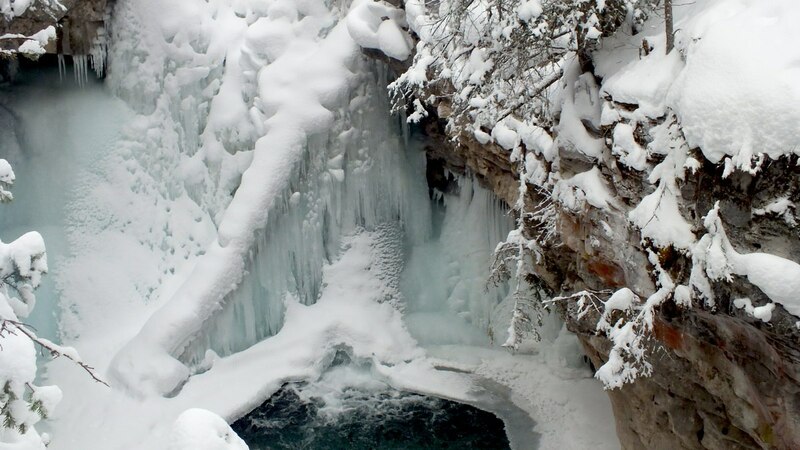 Over thousands of years, the Creek has carved Johnston Canyon from the limestone layers leaving the tributary with sheer canyon walls in the stretch before it empties into the Bow River just south of Castle Mountain. All along the series of protective walkways, spectacular views of the canyon and river were a constant. One mounted information board along the trail told us to watch for Dippers, lone smoky-grey birds that, even in winter, will bounce along the river rocks in search of food wherever the water remains open. We kept a keen eye but were not in luck that day – no Dippers to be seen. As we approached Upper Falls, there were two options for viewing the waterfalls. The trail branched in two directions with one leading to the bottom of the precipice, and the other to a viewing platform overlooking the summit of the cataract. 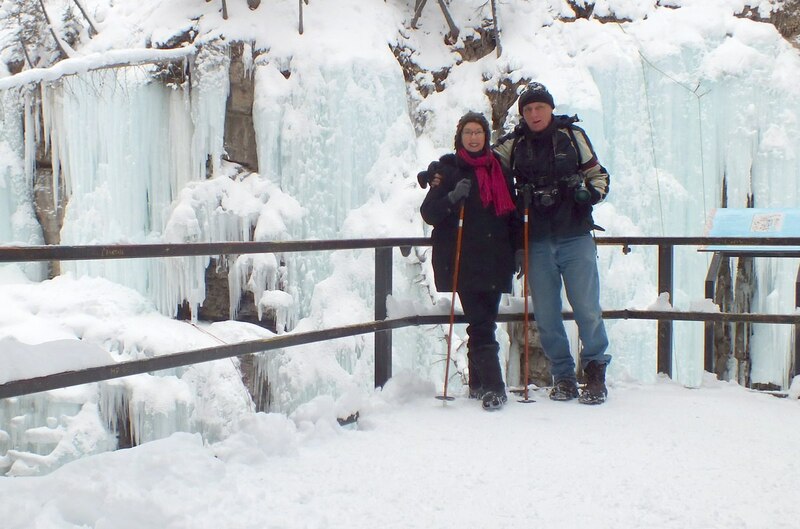 Bob and I chose the side trail to the river at the base of the falls for a view looking up at the frozen waterfall. 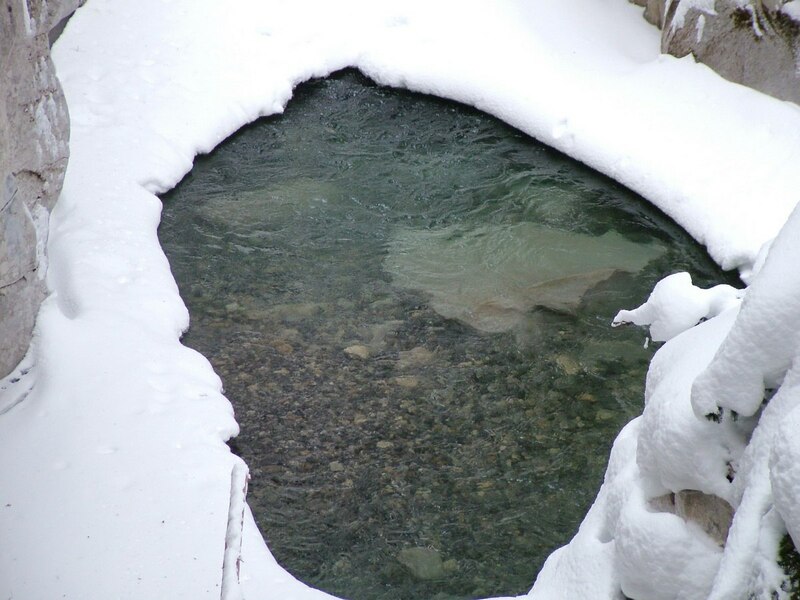 There, too, was a pool of water that was kept open by the continuous flow of the Creek beneath the frozen cascade. 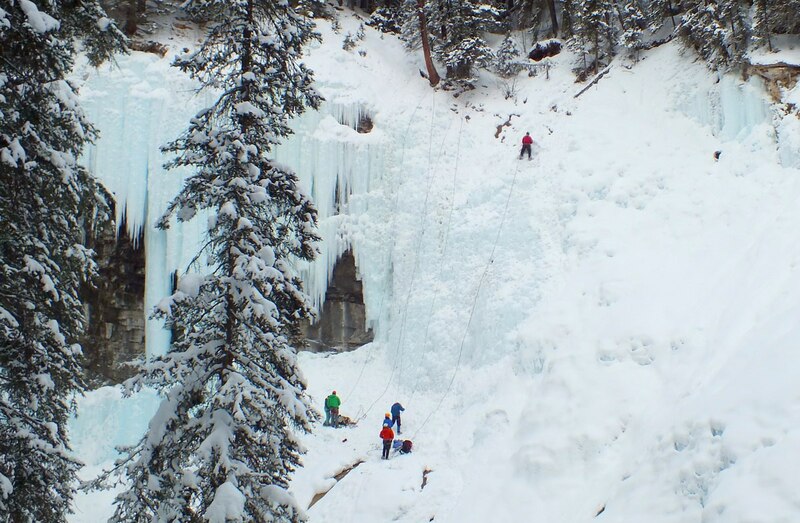 What we did not expect to find were about a dozen ice climbers practicing their skills, ice climbing the thick masses of frozen water. Their presence explained the lack of hikers in relation to the number of cars in the parking lot. 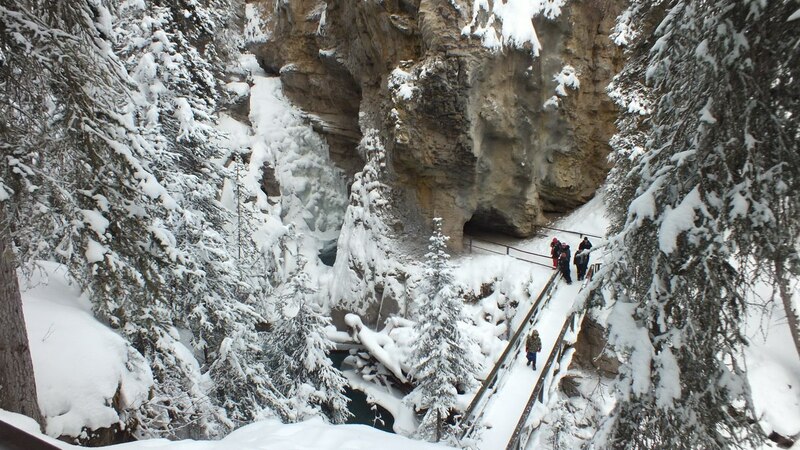 Few people actually hike the full distance into the Upper Falls given the effort required to walk the snow-covered trail. 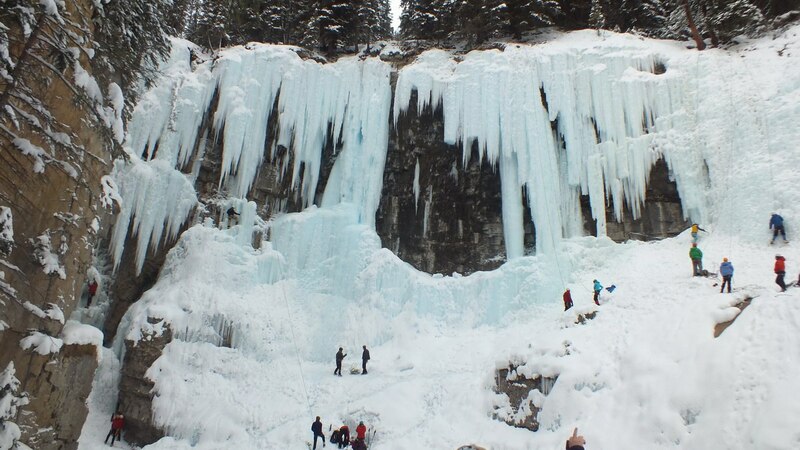 The frozen waterfalls provided a great opportunity for the ice climbers to enjoy their sport as they are an impressive 30 metres (98.5 ft) high. 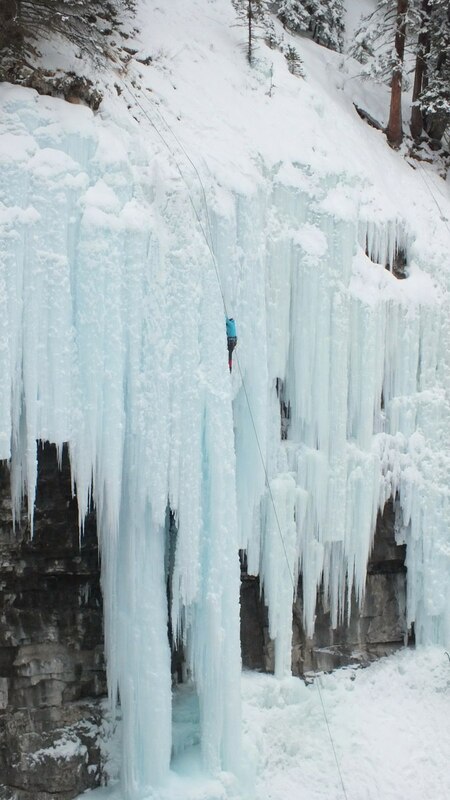 Bob and I were fascinated at the skill and strength required to surmount the solid slippery masses of ice, but relieved to see that every precaution was taken to keep the climbers safe from injury. 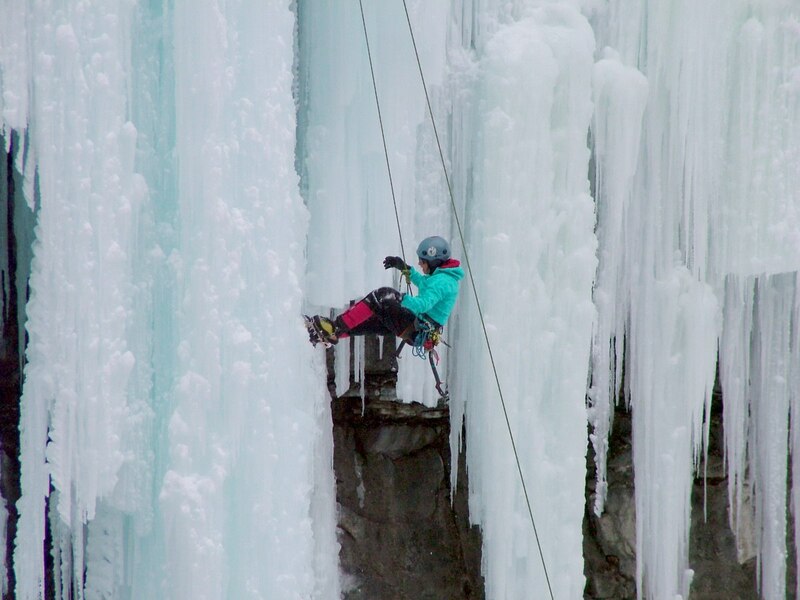 Technically speaking, ice climbing is the act of climbing a variety of inclined ice formations while remaining protected through the use of safety ropes and other protective gear. The types of ice are affected by weather conditions and therefore vary considerably in consistency. 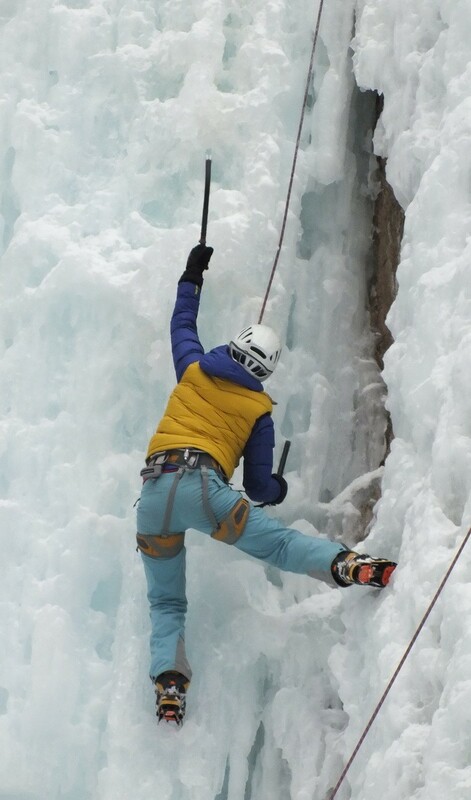 Climbers must asses the ice as it can be soft, hard, brittle or tough. 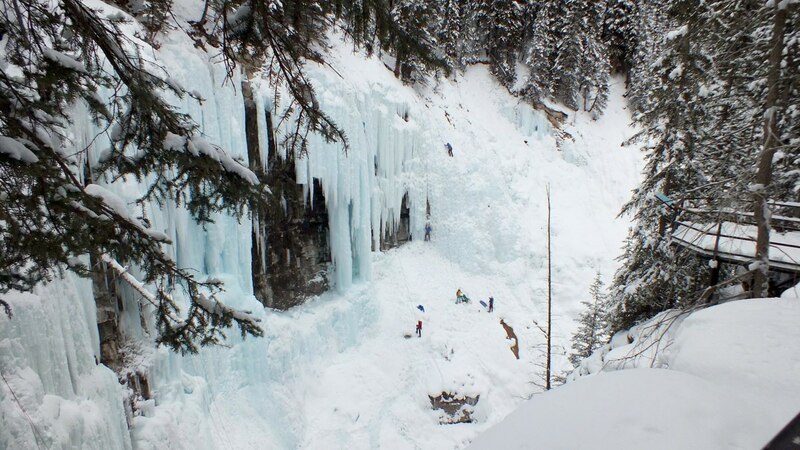 At any one time, several ice climbers were ice climbing the mounds of frozen ice that had accumulated below the gargantuan icicles in preparation for scaling the vertical spikes of frozen water, but not all of those surfaces belong to the frozen waterfalls. There are two types of Water Ice both of which is a frozen liquid flow of water. 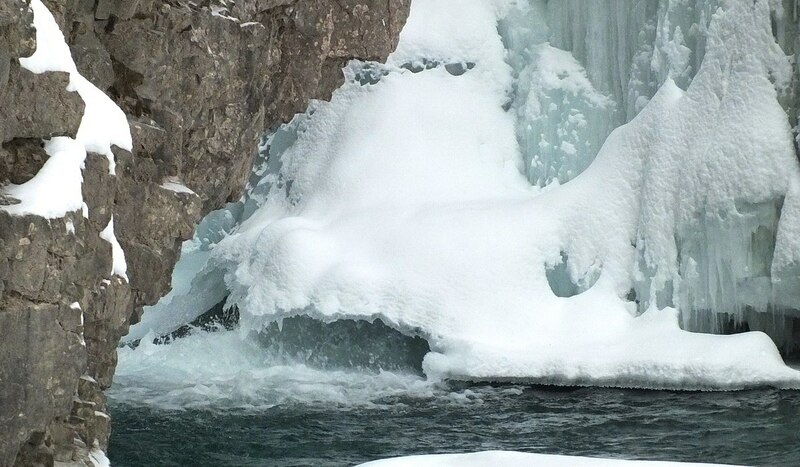 Some Water Ice occurs when an established waterfalls becomes frozen, while other Water Ice is formed when an overflow of water trickles over cliffs and rock slabs and gradually freezes into a thick layer of ice. 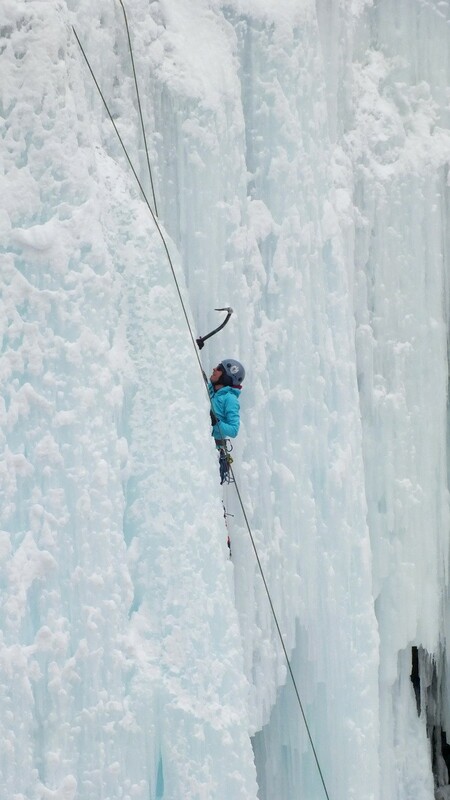 Water ice presents climbers with a higher degree of technical challenge than alpine ice, which is a whole other ball of wax. After observing the ice climbers for a significant amount of time, Bob and I then scaled a short, steep slope on the main trail to get to the top of the falls. There, another viewing platform is situated so as to afford an excellent view of the river before it plunges over the escarpment. The platform hangs out over the gorge. 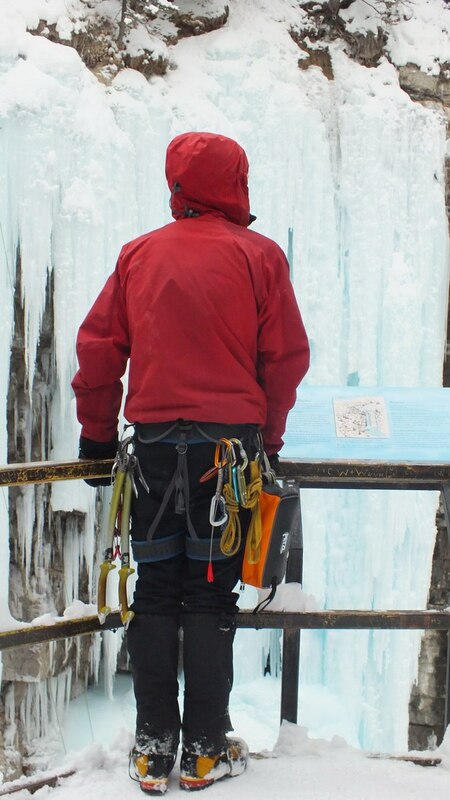 As we savoured the view of the winter landscape, one of the ice climbers happened by fully attired with his ice climbing gear. My goodness, he was well equipped. 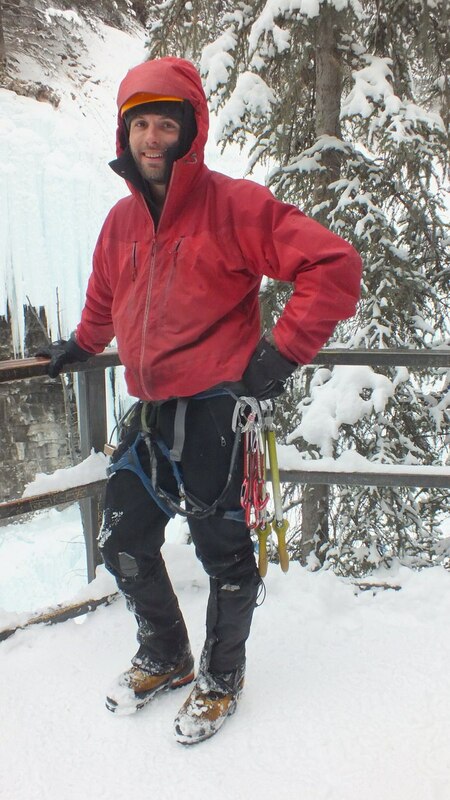 His harness was hung with Quickdraws, Slings, Ice Tools, Caribiners, and myriad other necessities to ensure his safety when climbing. From our vantage point high above the frozen river, the depth of the gorge accentuated the challenge facing the ice climbers. 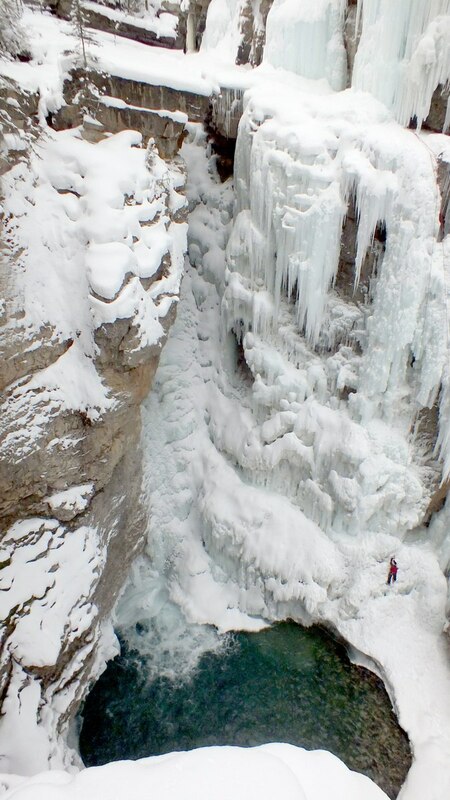 As we talked, Bob and I learned that over the years, a number of ice climbers have fallen to their death their in Johnston Canyon. It was pointed out to us that, on the opposite side of the gorge, some permanent ropes, to be used as safeties, have been affixed to trees, but even in placing those ropes, one young person succumbed to his injuries after a misstep saw him plummeting 30 metres to the hard surface below. 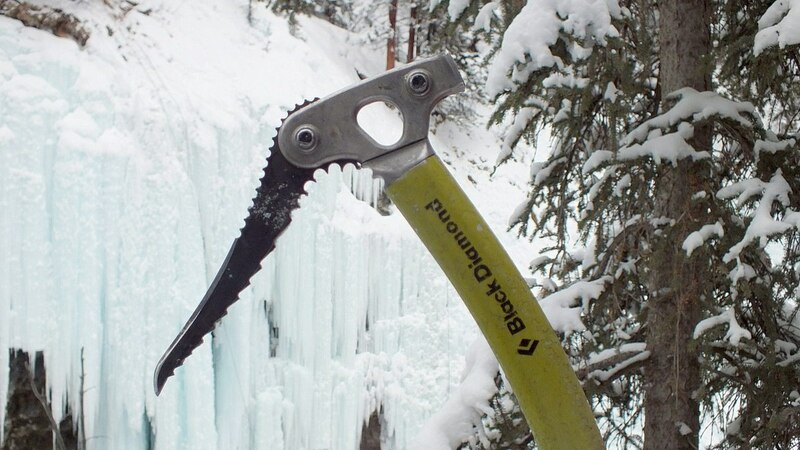 This Ice Axe is one of the staples carried by ice climbers who often will also have on hand replacement picks in case this one snaps off. 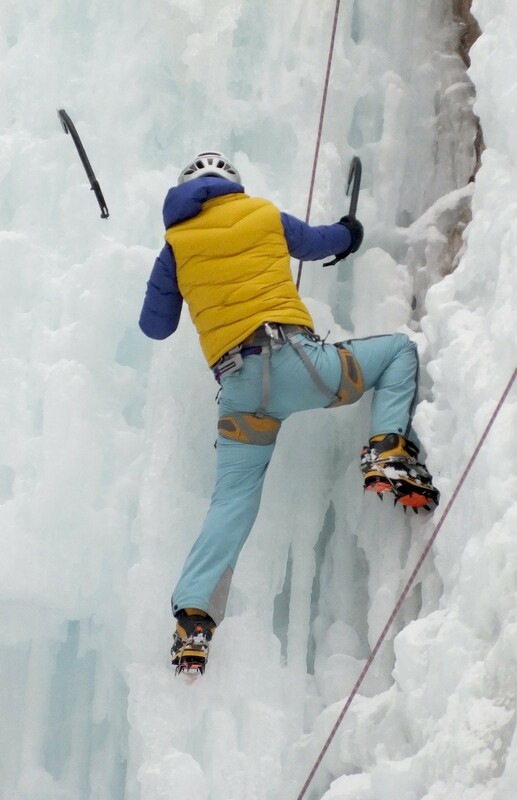 This photograph aptly illustrates the use of Ice Axes or Ice Picks as well as crampons affixed to the specially-designed boots. A safety rope attached to the climber’s harness and a helmet are always a must in case of a fall. Because the ice formations at the edge of the cliffs were better lit by sunlight, being above the shadowed interior of the gorge, the beautiful shades of blue and mauve shone through the clear ice. Bob and I left the ice climbers behind as already the forest was growing dim, but they seemed undeterred by the diminished sunlight that late in the afternoon. We had the hiking trail pretty much to ourselves on the way out, but we did not dally as I had a birthday dinner to go to. We were celebrating at one of the dining establishments in Chateau Lake Louise that evening. Having built up a good appetite from our day’s pursuits, I could hardly wait. Thanks for letting us know, Jonny. At the time, Tyler had given us his name, but over the course of our trip, I misplaced the information. 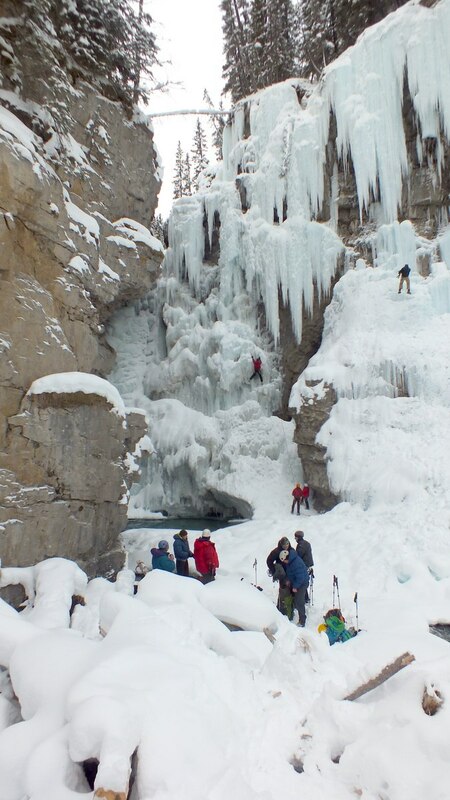 Johnston Canyon was a great place for us to hike, even better for you guys who dare to scale the ice formations. I’m glad you enjoyed reading our blog. I so enjoy receiving and reading about all your travels. As a winter person I particularly loved seeing this one on Johnson Canyon. I was there many years ago in the summer. When we go west each March we downhill skiing, mostly to; Panorama, Kicking Horse, Revelstoke and/or Fernie, but we also have great memories of Lake Louise, where we were engaged in 1986. Many blessings and safe journeys to you. Thanks for your comments, Cynthia. Bob and I love winter and winter sports and have been grateful for the sustained cold snap these past three months. It has allowed us to enjoy cross-country skiing, skating and snowshoeing more frequently than usual, both in Alberta and here at home in Ontario.